This is a series of lessons that should take approximately 15 minutes each while the teacher can take care of clerical duties. 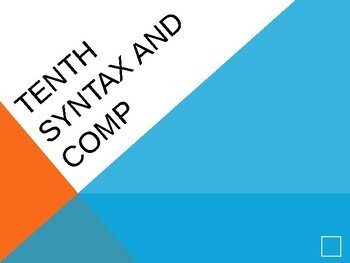 However, if you want an academic, integrated approach to grammar, standardized testing, and sentence structure in coordination with writing instruction, this is it! Students are instructed in (approx. 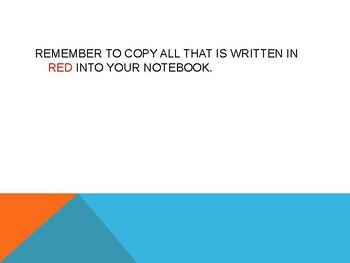 50) 15-minute lessons that demonstrate methods to make their writing more mature and natural. They learn this by writing short, medium and long sentences, sometimes 40 words in a sentence. 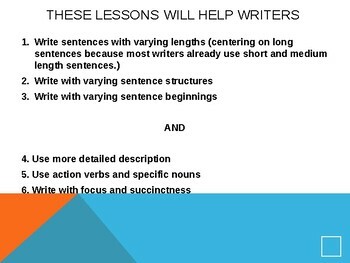 Lengthy sentences require lots of information, ideas, stats, a goal, and a knowledge of many types of sentence structure, punctuation, grammar, and placement emphasis. All of this information is presented in the lessons; students then practice the structures. This sophomore unit is one in a four-part series for 9-12. Since this is created for the sophomore level (it can be used for 9-11), there are lessons for the standardized test, especially the PSAT early in the power point. 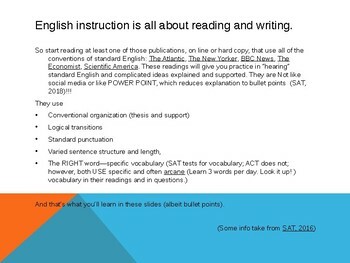 Later, as they move through the year, there are more exercises for the SAT and ACT. There is a series of lessons on how to spot fallacies of logic, a related clever story about fallacies of logic, a series on how to do responsible research on the web and elsewhere, a lesson on Plato's Allegory of the Cave, among other lessons.